Join us at our new taproom on Dolphin Dr. in Waukesha. Located at our production brewery, our new taproom offers 15+ RG beers on tap, excellent food and great views of the brewery. We hope to see you soon! Directions here. Join us at our new taproom and pair your favorite RG beer with the pizza that you have come to love. Our kitchen is open Tuesday through Sunday, so stop in for some of the best scratch-made pizza to go alongside your award-winning beer. Scott is University of Wisconsin graduate and is currently a Dermatopathologist at Quest Diagnostics. 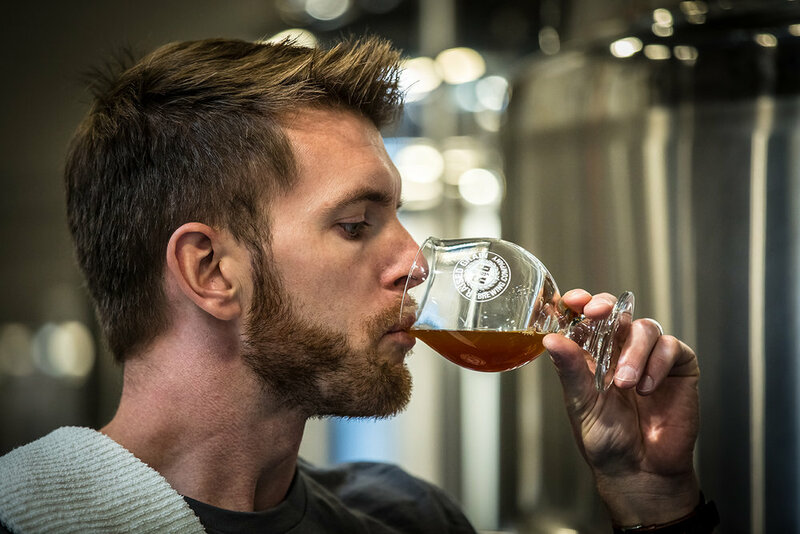 To say that he is an avid beer fan is an understatement - in fact, he has made it a point to enjoy a beer a day for the past three years and has no plan on stopping any time soon. Scott is the driving force behind our beer, from recipe design to kegging the beer that goes into your glass. Jimmy is also a University of Wisconsin graduate and is currently an Internist in the Vascular Surgery department at Froedtert & The Medical College of Wisconsin. Jimmy’s ties to Belgium go far beyond his love of their beer - his dad was born and raised there and he spent a lot of his time growing up traveling to spend time with his family that still lives in the Wallonia region of the country, hence why you will find a robust lineup of Belgian inspired beers on tap in our taproom. Our award-winning beers always on tap. Stop in for something new or an old favorite. From our award-winning Paradocs Red IIPA to our Guitar City Gold Lager, our taproom features twelve of our Boldly Brewed Beers. We are continually developing exciting variations in our Waukesha brewery and our taproom is where we first roll them out. Join us for a pint of your favorite Raised Grain beer, a taster flight or grab a growler of fresh beer to go. We have three TVs and a projector, and we’re big Wisconsin sports fans, so there’s a strong likelihood you’ll be able to watch your game. Check out our event listing page to see all the other wild things we’ve got ‘on tap’ any given week. We fill all growlers, but we are pretty sure beer tastes better in ours! Ever since we opened our doors, we have aimed to provide the highest quality beer and experience to our customers. We are excited to be able to elevate that experience because we all know that nothing beats pairing your favorite beer with some delicious food. And you can be certain that the quality of our food will match the quality that you have come to know from our beer. Our Chef, Mark Jasso, has over 17 years of experience in the restaurant industry and was most recently a chef at the Milwaukee Public Market. He is a huge foodie and beer lover, which makes him the perfect partner in crime to create flavorful food to match our Boldly Brewed Beer.